My main motivation has long been building intelligent computing machines and systems that mimic some aspect of human perception or reasoning. This has naturally translated into what I have been doing that is extracting insights/actions from data of all types using a multitude of disciplines and technologies such as ML/AI for the purpose of creating value, either as new data products/services or improving the existing ones, to achieve a specific business objective. Since I was a little kid, I had a great interest in science fiction stories and movies that had to do with intelligent artificial beings like Hal in “2001 a space odyssey”, Data in “Star Trek the Next Generation”, and R2D2 in “Star Wars.” Those interests from early childhood led me to pursue my education in ML/AI and later focus on developing relevant applications in my professional work, even when it was not the fashion of the day. I am excited that these technologies are finally in the spotlight and have become a household name in the last few years. For someone who has long been dedicated to finding and developing real-world applications of these technologies, the recent interest in ML/AI is now even more motivating and fulfilling. We are the sums of our experiences. To great extent, they define who we are and whom we become. 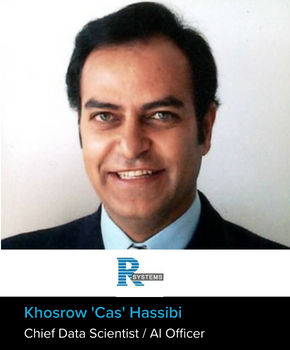 Early on during my career, I had the fortune of working with a few pioneers and visionaries in pattern recognition and machine learning at Case Western Reserve University and later at HNC Software. These encounters developed further interest in me to pursue the use of PAMLAI (Predictive Analytics, Machine Learning, AI) technologies in real-world business problems ranging from device failure, credit risk, handprint recognition, and fraud detection to many others. I have also been fortunate to work and engage with many talented people and innovative companies across the world—from Fortune 500 to small start-ups—each with their own unique data and analytics challenges. Through the years, such engagements and interactions have not only helped expand my horizon on potential uses of analytics but have also deepened my knowledge of the technologies involved. In my recent role, one of our areas of focus is intelligent or cognitive automation. These use cases have to do with manual processes that require some sort of human cognitive intervention to achieve their goals. Consequently, one needs to exploit computer vision, character recognition, speech understanding, and/or natural language processing technologies to address these problems. These applications are nothing new but with the recent advances in these technologies, there are great possibilities for further automation and more consistent decisioning. (1) Setting the reasonable expectations with clients given the ML/AI hype cycle we are in now. (2) Emphasizing the ever importance of data quality and proper labelling. As it is often the case, many clients believe that because they have made big investments in the data infrastructure, their data is ready for use for any application they may have. Data preparation and quality is often overlooked to a great degree in terms of resources and time. (3) Attention to change management required to rip the benefit of the project. At the end of the day, an intelligent automated process will still need human intervention though at a much lower rate. Those who rely on the process for their decision making or tasks, must have complete confidence in its results or the full benefit cannot be realized. We are at the start of a multi-decade innovation cycle in ML/AI. Due to availability of open source tools, computing resources (cloud), wide spread interest and explosion of data, there are enormous new business opportunities for building new intelligent systems for decisioning and automation (soft and hard). At the same time, due to the power of these technologies, we should not forget their dual usage. ML/AI can be used for Malicious purposes far beyond anything we have faced so far and we should prepare to address those in parallel as the applications continue to flourish in the coming years. Like any other profession, “passion” is the key for success in this area. I see many people who are attracted to this area because it is the fashion of the day or provides them better pay. If one plans to start for a long-term career in data and analytics, they must love and appreciate data, be analytically strong, and be creative.